Sometime in 2011, I came across this idea on Pinterest. I love the idea of writing down all of the year's funny moments and saving them to read on New Year's. Camaron thought it was a pretty cool idea, too. So we began secretly writing down funny things that either happened to us, or one of us did, and then we'd put them in a jar in our front room (we were secretive, because we really wanted to be surprised with what each of wrote when we finally went through the jar on January first). The jar looked really lame at first, because there were only one or two little crumpled pieces of paper in it for a while. But, it quickly began to fill up. Oh, my goodness. We opened it last night and we basically laughed our faces off. 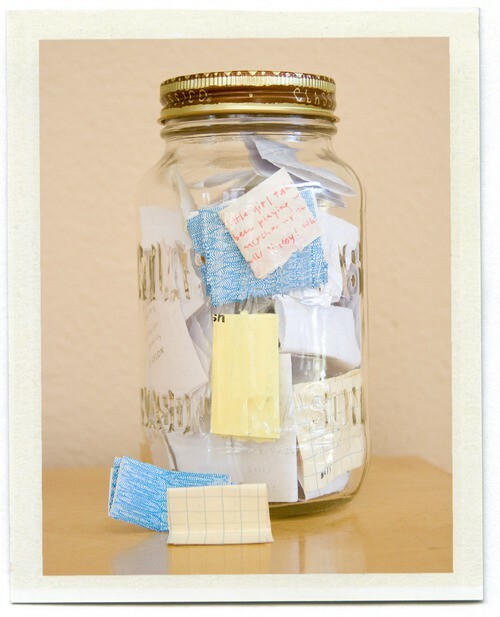 I am so excited to start our funny memory jar for 2012! This is awesome!! So funny. Why are you guys so cool? that is the most fun idea i've ever heard. i think i will start our "funny jar" today. you guys are so cute! thanks for the inspiration and happy new year! came across your blog and this idea on pinterest. LOVE this idea, so adorable! i am going to have to do this as well, thanks for sharing! This is GENIUS!!!!!! Thank you for sharing! love this idea so much! oh the memories! i would be almost scared to write down all the funny things that happen though. it would be kind of ridiculous! your yawning note made me yawn. How cute!! I love that idea. Happy new year!